How Did Life Get Here? 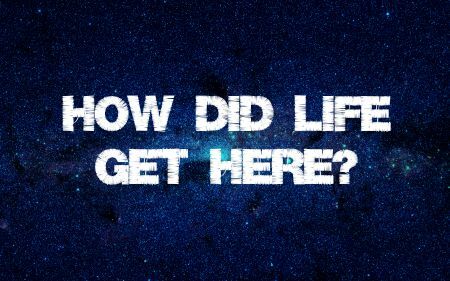 How did life start on Earth? I'm not talking about humans in particular...I mean the original microbial beginning. It had to have come from somewhere. Then again, if you believe that a higher being simply said 'let there be life,' then I suppose you don't need to read further. For the past several years, there has been some evidence from astrobiologists that support the view that life was seeded from outside Earth. The 'panspermia theory' suggests an extraterrestrial origin for life, as microbes find their way into comets and multiply and seed other planets. Namely, that humans and indeed all life on Earth is of alien origin and brought by comets hitting the planet. After a long discussion several years ago with my late friend, author and paranormal researcher Lloyd Pye, I was convinced that this may be a plausible argument under the proper conditions. The method suggested is that comets hit planets and push living organic matter out into space, some of which survives and in turn gets transferred to developing planetary systems over a timescale of millions and millions of years, seeding life on the newly formed planets. This model still does not explain how life actually began in the first place...in fact, there is no hard evidence to support the theory that life only began in a 'primordial soup' on Earth, or other places. I believe that all versions of panspermia suffer from a big gap in our current knowledge. It must be figure out how to go from an astrophysically delivered entity (which contains substantial information) to one which has the characteristics of what we normally regard as life. It may be possible for these microbes to survive within our solar system, say directly from Mars to Earth. But interstellar space survival seems to be a long shot. Then there's the phenomenon called 'red rain'...that sporadically falls on the southern Indian state of Kerala. Heavy downpours occurred in which the rain was colored red, staining clothes with an appearance similar to that of blood. Yellow, green, and black rain was also reported. Colored rain had been reported in Kerala in as early as 1896 and several times since then. It was initially announced that the rains were colored by fallout from a hypothetical meteor burst, but a study commissioned by the Government of India found that the rains had been colored by airborne spores from a locally prolific terrestrial alga. Other explanations were proposed but not until early 2006 did the colored rains of Kerala gain widespread attention in the popular media. A controversial conjecture that the colored particles were extraterrestrial cells was proposed by Godfrey Louis and Santhosh Kumar of the Mahatma Gandhi University in Kottayam. For years, claims circulated that red rain contained cells unlike any found on Earth. Newer evidence that these cells can reproduce was published by MIT in the Technology Review. While this is certainly not a mainstream idea in science, a growing body of evidence suggests that it should be carefully studied rather than casually disregarded. For example, various organisms have been shown to survive for months or even years in the harsh conditions of space. And one of the more interesting but lesser known facts about the Allan Hills 84001 Mars meteorite that some scientists believe holds evidence of life on Mars, is that its interior never rose above 50 degrees centigrade, despite being blasted from the Martian surface by an meteor impact and surviving a fiery a descent through Earth's thick atmosphere. If there is life in the cosmos, the evidence suggests that it could survive the trip to Earth.